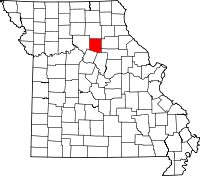 Randolph County, named for well known Senator and orator from the early 1800s, John Randolph of Roanoke, is located in the northern part of Missouri and has a large agricultural focus. The Randolph County Historical Society runs two museums in the county with the main one located in the town of Moberly at 223 N Clark St. Many of the records on file at the museum are dated back to the early and mid 1800s, and Society volunteers will perform light research requests for free, while requests that require more time and research cost $10 per hour. The Society website also provides a number of additional resources, many of which direct to agencies such as the Bureau of Vital Records under the operation of the Missouri Department of Health and Senior Services, and the Missouri State Archives. Both offices are located in the state capitol of Jefferson City, MO.